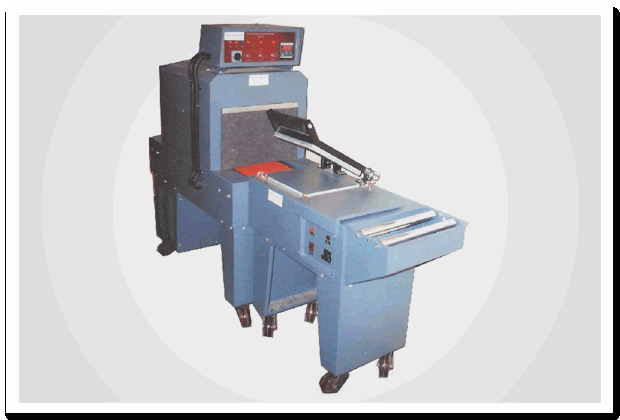 Manual L Sealer With Shrink Tunnel Machines|manufacturers and Suppliers in Mumbai. This advanced L-Sealer machine is used for creating a package enclosed with in shrink film. It is mainly used for sealing Stationery, Gift Packets, Confectionery Items, Welding Rods, Bottles, Cosmetics & other products. L-Sealer is the number one choice worldwide for exclusive features such as adjustable working platform with heavy duty electronic timer that takes minimum of 2-3 seconds per cycle. Sealing system for accurate seal and cutting. The machine is highly reliable and provides years of dependable service. These Machines find applications for Stationery, Sweets, Gift Packets, Confectionery, Welding Rods, Bottles, Cosmetics, etc. Model Seal Area Power Con. Power Mec. Dia.